After supporting the community during recent flooding the Colfax-Mingo high school football team is hoping to get a lot of community support on Friday night when they open the season at Nevada. 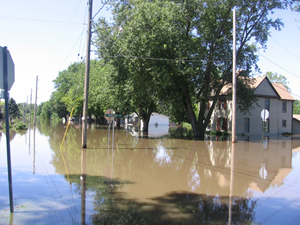 Members of the team helped fight a record flood that hit the town of Colfax on August 11th. Their field and practice area were dry, but Colfax-Mingo coach Mike Rupert had phone calls about people needing help with sandbagging and to move things from flooded homes, so he released the kids to go help. He thought they would come back and have a short practice late in the day, but Rupert says the kids continued working throughout the day in the heat and they finally canceled practice. The were impacted throughout the week as players helped their families recover, but he says the players worked hard and did a great job in helping with the flooding. Rupert says the team tried to mix in some practices while also helping with the cleanup for several days. He says the did practice Thursday, and then many of the kids went out and sandbagged in the heat of the afternoon. “I told them I don’t know if we’re going to win any games or not, but they are definite winners,” Rupert says, “it’s just impressive to see what they did this last week and a half. More than 300 homes in Colfax were damaged by the flood and Rupert hopes the team will give the town something to cheer for. He says they had a scrimmage night the other night and they had a nice crowd, and he hopes the community supports them throughout the season. The Tigerhawks play their first home game on September third against Saydel.